Are you looking for a reliable and sturdy baby gate? Then you may want to check out the North States Superyard 3 in 1 Arched Decor Metal. The North States Superyard 3 In 1 Arched Decor Metal comes with six removable and adjustable panels. This product will enclose up to 10 square feet, and is 30 inches high. There are two optional play yard extension panels, that can increase the size from 10 square feet to 19 square feet. This gate can also be hardware mounted, or can be used as a play yard. The swinging walk through door panel has a child-proof double-locking system. This works on all surfaces both indoors and outdoors. It will not scratch your floor, since each panel has a pre-attached rubber foot. This also works well with small pets. All products from North States are JPMA certified. When ordered, in the box you will receive one six panel, pre-assembled 3-in-1 Arched Décor Metal Superyard, eight screws, one floor spacer, four wall fittings, one wall fitting template, and one instruction manual. As of this writing there were 406 customer comments and 168 answered questions for the North States Superyard 3 In 1 Arched Decor Metal. I've read through the customer feedback and then condensed the results into this review. I hope that this helps you when shopping for a baby gate. "It's an awesome product and very long. I love how you can take parts off to make it the length you want. It was so hard trying to find a gate to fit the length of our kitchen opening, but this worked wonders and we use it everyday to keep our dogs in the kitchen and out of our family room." "An amazing freestanding fence. Exactly what i was looking for for my baby! Stands by itself, I often sit on the floor while playing with my baby and lean on it - no problem! No need to destroy the walls and attach it. Look no further - this is the one!" "The bars are very close together - our cat cannot fit through them. If you have cat that may need to pass thru the yard/gate to get to the litter box etc, you may need to rethink that." "This is a great gate. I have had many and a lot more expensive than this one. I was leery to buy because the price was low and didn't think the quality would be good, but it is very solid. We walked through the gate frequently and still as good as when we first got it. You can bend in all kinds of shapes to fit the space you need to block off." This gate system will not work with an odd number of panels without the need to buy a mounting kit. It is important to measure the space that you'll be using it in and then plan accordingly. "What they do not tell you, is that if you configure it to use as an odd number of panels then you must buy an additional mounting kit. The set up is strange because instead of each panel having a positive and negative end they're actually positive and negative panels. So if you use an odd number of panels you end up with two positive ends and the mounting kit they provide won't work. It is roughly $20 to get this new mounting kit." 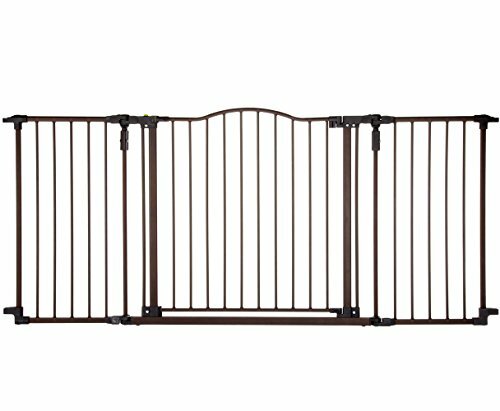 The North States Superyard 3 In 1 Arched Decor Metal is a 144 inch long gate system. If you intend to use an odd number of panels, you will need a mounting kit since each side has a negative and positive end and must fit together. This is one of the few very long gates on the market. Many people used it to block off a fireplace section or to make a free standing play area. It is not cheap, but for the size and durable construction, most people felt that it was well worth the price. I hope that my review of the North States Superyard 3 in 1 Arched Decor Metal can help you decide if this is the right baby gate for you! For more information, check out the rest of our baby gate reviews.